This historic, 2-hour walking tour begins at the corner of State and Congress Streets at 3pm, across the street from the Old State House. Meet and greet the tour guide and follow along with the rest of the group into the streets of Boston. Begin at the Faneuil Hall Marketplace and Quincy Market. Walk through the Blackstone Block Historic District en route to the New England Holocaust Memorial. Look through the windows of the Union Oyster House, America's oldest restaurant, and the Bell in Hand Tavern, America's oldest tavern. On the way to the North End, stop at Haymarket, Boston's centuries-old outdoor market. Then see all of Beantown's best Italian restaurants in 'Little Italy.' 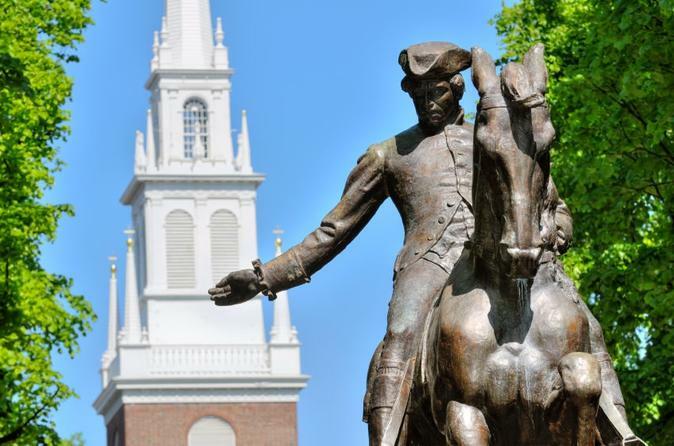 Visit the Old North Church and the Paul Revere House, two of the most historic buildings in Boston. Then, walk along Boston Harbor and get a glimpse of the USS Constitution, also known as 'Old Ironsides,' the legendary, indestructible warship. The tour concludes near the North End’s most popular attractions, restaurants, and points of interest for further exploring afterwards, if desired.